Last edited by Chad; 11-05-16 at 05:59 PM. The irony here is nice if not drawn out. The doctor, with his cape in an early scene, seems like a most obvious candidate to be the killer and the actor makes effective bulging eye stares and subtle grimaces to nicely dig in that he is the culprit. The gorey details of blood clots around the wounds is nicely detailed and the pesudo-science is fun but the telepathic control elements are too far out for my taste. The auntie character really tries to steal the show, which gets old fast. Maybe it's telling that the women characters are worrywarts or the ever damsel in distress Fay Wray. Last edited by Undeadcow; 10-06-16 at 02:51 PM. I couldn't say for certain, but the Alyxstarr link version is only 1 hour and 2 minutes not sure where its streaming from. I can't help picturing this whenever someone mentions the Burgermeister. my dvd is also 62 min. A version on Snag is 58 min. Same here! Enjoyed the film, and the whole theme day of films older then me. I've always really liked the English version of Dracula for that iconic Renfield laugh. I've never seen The Vampire Bat, but felt it was well done. Herman even rewards us with a variation of the Renfield laugh. This is my second movie of the night with a Burgermeister. Last edited by WillieMLF; 10-07-16 at 08:04 AM. I'm a sucker for old 30s films like this. Something spooky is going on, and everyone talks about it. I thought the film handled the mentally handicapped man fairly well, and the mob scenes are the most chilling parts of the film. It's tragic that there is historical basis for the situation portrayed. I'm also happy to Fay Wray show up in stuff! I agree on both counts! The telepathic element came out of nowhere. However, I'm recalling that it's a common-ish plot device for the time, right up there with hypnotic suggestion. I'm glad I wasn't the only one annoyed by the aunt. Those bumbling, comedic characters only work for me if they are used sparingly. It frustrated me that she had to show up at the end to make lame jokes and ruin the bit of tragedy the movie was generating. Agreed on the "humor" points. I'm not sure why anyone thinks horror movies need punchlines. Other than that i enjoyed revisiting this one, which I watched for an early Challenge. It's nice and creepy at times, and the filmmaking is good, particularly for the time period. 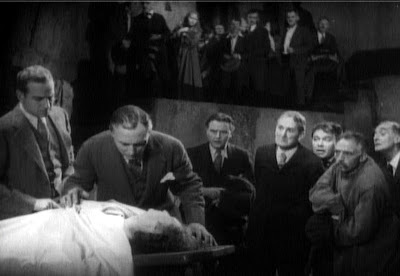 A lot of familiar faces in this one (Fay Wray, Lionel Atwill, Melvyn Douglas, Dwight Frye). Short but enjoyable with a nice little mystery underlying everything (and its not a vampire bat). Dwight Frye steals the show as Herman, the friendly bat loving town idiot. It warms your heart hearing him defend his little friends: "Bats ... GOOD!!! Soft ... like kitten!" This one left pretty much no impression on me at all. I watched it last night, and when I sat down to write a few comments about it, nothing came to mind. So I thought that I'd sleep on it and return to write comments tonight. I have to agree with mrcellophane that it's always a pleasure when Fay Wray is around, and I thought that Melvin Douglas was solid...but the aunt character REALLY annoyed me, and Lionel Atwill did his Lionel Atwill thing. Again. And what was that new "life" that he had created? Sorry, dude, but potatoes have been around for a while. Try again. Overall, it was watchable, but a music score would have helped it along tremendously. As it stands, it may be my least-favorite 1930s horror film. This forgotten classic is like a vampire horror, mad-scientist drama, and murder mystery all rolled into one. It's as if they took all of the popular Universal movies of the time and jammed them together in a movie that doesn't really have the same impact as movies like Dracula or Frankenstein. Locals are turning up killed and drained of blood, with puncture marks in their neck. This film features everything you'd expect from an early 30s horror. Angry villagers with torches, fast-talking men with thin mustaches, and women who just seem to be there to be scared and obedient. Apparently Fay Wray was in this but I couldn't tell you what she did, because the females aren't given anything to do. Anyway it is the product of its times, and that may not be entirely fair, because my favorite character is Auntie. She has all of the best lines, and is like a walking, talking Web MD. She goes around making up illnesses and attempting to diagnose everybody with crippling diseases, she even concocts her own remedies, which mostly just make her gassy. Movies of this era can be so funny in a strange way. The movie ends with a murder-suicide, and not 30 seconds later a dashing hero makes a corny joke and practically winks at the camera before THE END flashes on the screen. A total 180 in tone in mere seconds. The film is only an hour long, but if you dislike talky, pre-code dramas, this movie won't impress you. It doesn't transcend the genre and it's certainly not timeless like Nosferatu. However, if you're a fan of 30s horror films, there's a lot going on that should entertain, even if it seems rather unoriginal. I am glad to hear others didn't like the character of the aunt as well. I found her obnoxious and unfunny. The atmosphere is good but The Old Dark House is way better (and I read they both used the same sets). Nice to see Melvyn Douglas. While he wasn't as charming as he was in TODH, I chalked that up to him playing an entirely different character. Fay Wray was fine but wasn't given a lot to do. I found Dwight Frye to be okay but trying a little too hard to be a retarded Renfield. I found the wrap-up to be predictable and not very interesting. There are a lot better 1930's horror out there. The Vampire Bat is a mediocre flick that aimed to get some of the box office success of Universal's horror films. I found it talky and tedious, and the audio and video on the public domain DVD I watched were dreadful. Auntie was the only character I liked. I wanted to give Vampire Bat some credit due to it's age but The Most Danerous Game, for example, is an example of how awesome movies from that era can be. I guess I'm in a similar situation. It has been a while since I saw it and hadn't commented yet, and I can't really remember all that much about it. I remember thinking it was all right, and I enjoyed seeing the guy who played Renfield in a similar role here.